White paper on crime 2004 Part1/Chapter1/Section5/1. Fig. 1-1-5-1 shows the number of persons newly received by public prosecutors offices for violations of Income Tax Law(Law No.33of1965),Inheritance Tax Law(Law No.73of1950),Corporation Tax Law(Law No.34of1965),Consumption Tax Law(Law No.108of1988),and Local Tax Law(Law No.226of1950),over the last10years.Corporation Tax Law violations have been the largest since1998.Local Tax Law violations had been on the rise,but decreased in2003.The Local Tax Law was amended in2004(entry into force in June of that year)to make punishment more severe for offenses related to light oil delivery taxes,which have the largest share of the total cases of Local Tax Law violations. Table 1-1-5-2 shows the number of cases and the amount of tax evasion per case charged from the National Tax Agency to public prosecutors for violations of tax laws,in each fiscal year over the last five years.There were21cases of tax evasion with the amount over¥300million and15cases over¥500million in FY2003(Source:Data by National Tax Agency). 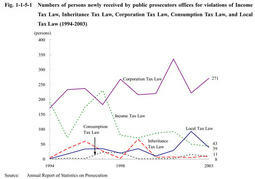 Table 1-1-5-3 shows the number of persons prosecuted or not prosecuted by public prosecutors over the last five years for violations of the Income Tax Law,Inheritance Tax Law,Corporation Tax Law,Consumption Tax Law,and Local Tax Law. In 2003,among those prosecuted,summary order was requested for one person prosecuted for Consumption Tax Law violations,and formal trials were requested for others(Source:Annual Report of Statistics on Prosecution). Persons disposed by courts in the ordinary first instance in2003were42for Income Tax Law violations(41were sentenced to imprisonment with labor for a limited term,and one to fine),seven for Inheritance Tax Law violations(sentenced to imprisonment with labor for a limited term),167for Corporation Tax Law violations(78were sentenced to imprisonment with labor for a limited term,84to fine,and the prosecutions dismissed for five),and four for Consumption Tax Law violations(three were sentenced to imprisonment with labor for a limited term and one to fine),13for Local Tax Law violations(eight were sentenced to imprisonment with labor for a limited term,four to fine,and the prosecutions dismissed for one)(Source:Annual Report of Judicial Statistics,and Data in the General Secretariat of the Supreme Court). See Appendix1-7 for the terms of imprisonment with labor sentenced for financial and economic offenses in the ordinary first instance during the period from1999to2003.